Thanksgiving is almost here. That means getting together with family and friends and, of course, lots of great food. Here is a catalog from the Trade Literature Collection that might get you in the cooking or baking mood. Or maybe the recipes will just make you hungry. The catalog, by the Majestic Mfg. Co. of St. Louis, Missouri, is from 1899. The title is Majestic Cook Book, Compiled by…the Best Housekeeper in This or Any Other Country. It begins with descriptions and illustrations of Majestic Ranges and then continues with customer testimonials and recipes for lots of different types of food. It ends with general advice for housekeepers including how to manage the plumbing in a house. Majestic Mfg. Co., St. Louis, MO. 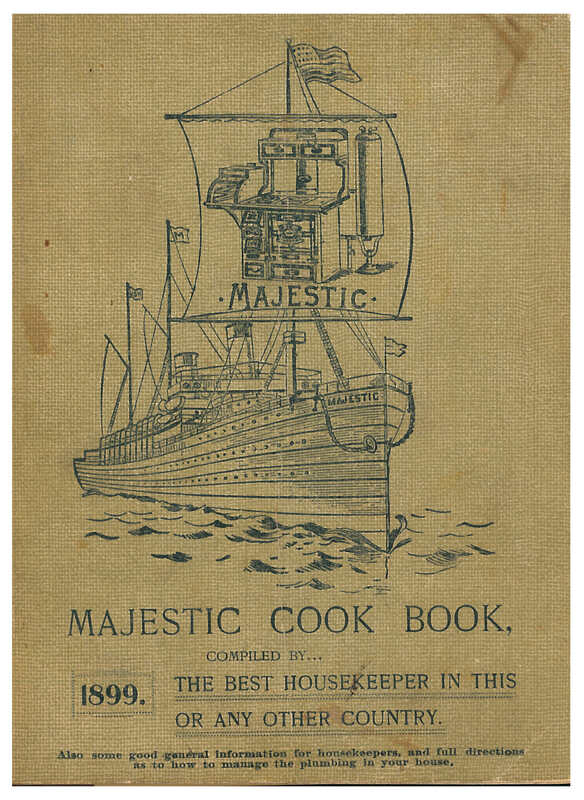 Majestic Cook Book, Compiled by…the Best Housekeeper in This or Any Other Country, 1899, front cover showing a ship. Majestic Mfg. Co., St. Louis, MO. 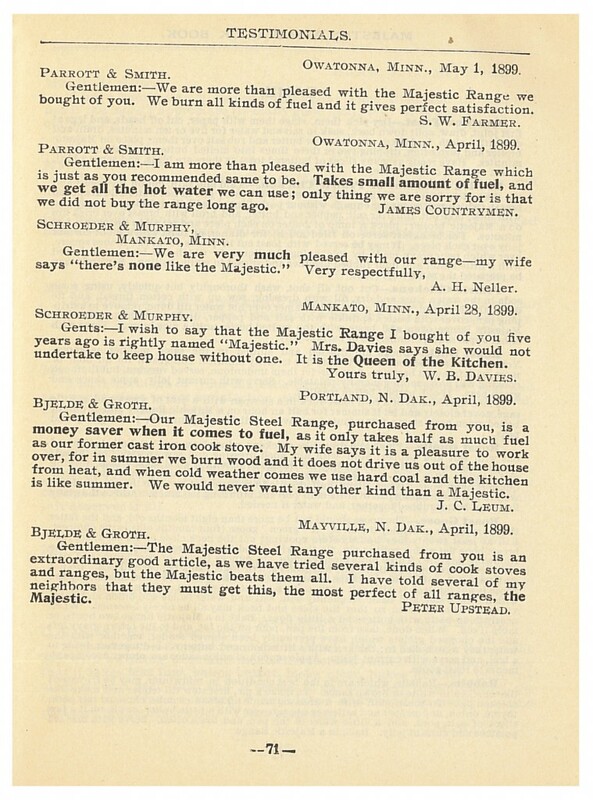 Majestic Cook Book, Compiled by…the Best Housekeeper in This or Any Other Country, 1899, page 27, Majestic Range No. 251. Majestic Mfg. Co., St. Louis, MO. Majestic Cook Book, Compiled by…the Best Housekeeper in This or Any Other Country, 1899, page 71, testimonials from customers using the Majestic Range. So with Thanksgiving just around the corner, we’ll end with some pie recipes from 1899 found in the Majestic Cook Book. 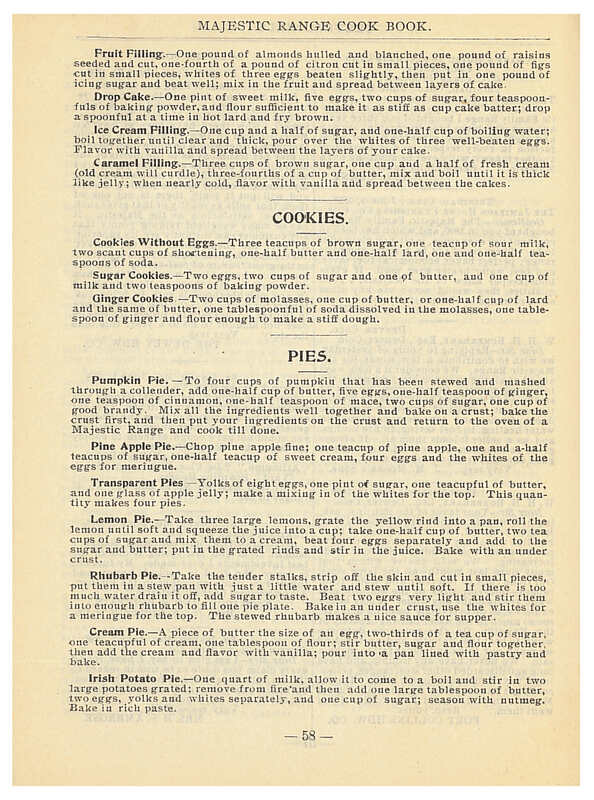 The recipe section begins with two pages of directions, tips, and even definitions which also gives us a glimpse into cooking and baking in 1899. Wondering what “butter the size of an egg” means? According to the Majestic Cook Book, that would be two ounces. Majestic Mfg. Co., St. Louis, MO. 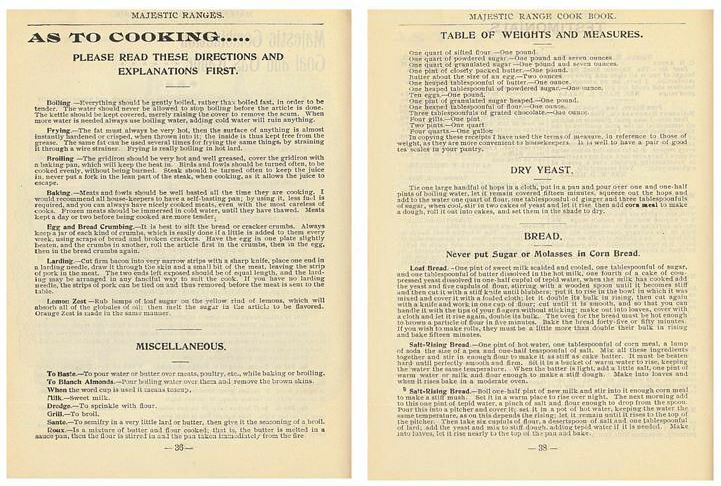 Majestic Cook Book, Compiled by…the Best Housekeeper in This or Any Other Country, 1899, pages 36 and 38, cooking directions, table of weights and measures, and recipes for dry yeast and bread. The page below includes recipes for cake fillings, cookies, and pies. Of course, there is a pumpkin pie recipe, but some of the other recipes are Irish Potato Pie and Cream Pie with vanilla flavoring. Or have you heard of Transparent Pie? Ingredients for Transparent Pie include egg yolks, sugar, butter, and apple jelly. Majestic Mfg. Co., St. Louis, MO. Majestic Cook Book, Compiled by…the Best Housekeeper in This or Any Other Country, 1899, page 58, recipes for cake fillings, cookies, and pies. Click to Enlarge. Majestic Cook Book by Majestic Mfg. Co. is located in the Trade Literature Collection at the National Museum of American History Library. Next Post Swahili Coast: Exploration by French Captain Charles Guillain, 1846-1848. Part 1, Re-building an Empire and Emancipating Slaves. We have this catalog. And the stove. It is our main cook stove in the ranch house and does work brilliantly and does burn less fuel than other stoves snd is safe – if you maintain it. It is a pleasure to cook on and easy to use. The advertising claims made in the catalog are true. I have a Majestic stove in my house that I don’t know much about. Is there anywhere I can get more information on it or have someone show me how it works? Ours has been hooked into our baseboards and I haven’t found anyone who can show me how it works. How can I get a digital copy? Hi Scott, although we are rapidly digitizing our collection, this item has not yet been fully digitized. We hope you enjoy the images available in this post! 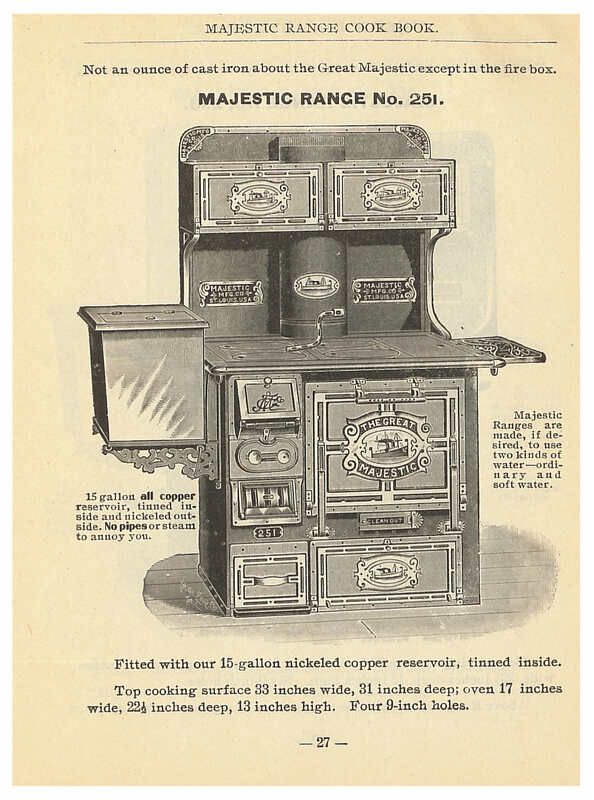 I have recently purchased a Majestic Cook Book, showing a drawing of the stove on the front. It reads on the front “also extracts from US Government Bulletin regarding economical use of meats.” It also says “A Model Kitchen”. I was wondering if you were familiar with this paperback booklet or knew the date of print Thank you. The Majestic Mfg. Co. trade catalogs in the Libraries’ Trade Literature Collection do not appear to match the item you are describing. The item highlighted in this particular blog post dates to 1899. I have a Great Majestic Junior which is extremely rare as I understand it was a salesmans sample to help sell the stoves.I would like to know its value and should I sell it or give it to a museum? I have a Great Majestic , does anyone know what the numbers mean on the clean out door mi e is 36448. Thanks Lot trying to date it. Thank you for your comment. The Libraries’ Trade Literature Collection includes three Majestic Mfg. Co. catalogs. You are welcome to email us at AskaLibrarian@si.edu with more detailed information as to what you are searching for regarding the stove.